Gracie Barra Glendale is a Martial Arts School offering Brazilian Jiu-jitsu classes in Glendale, CA for kids, men and women. Gracie Barra Glendale is Located at 325 North Brand Blvd. View a Location Map, get Directions, Contact Gracie Barra Glendale or view program details below. 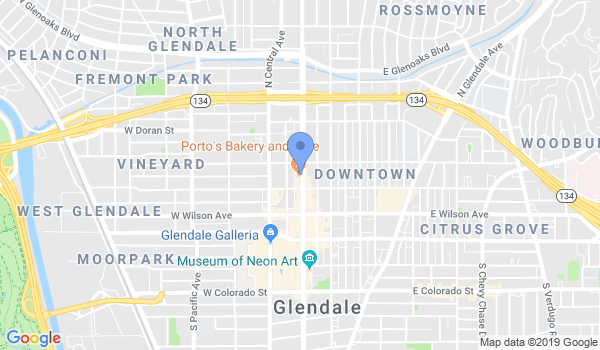 If you are a student at this school, help your local Martial Arts Community by writing a Review of Gracie Barra Glendale. You can also help your school by sharing it on Facebook, Twitter, Google+, Pinterest etc. Classes everyday (fundamentals and Advanced) at 6 and 7, Saturday and Sunday at 10 am. Kids classes from 4 to 12 on Tuesday and Thursday at 5, Saturday at 10 am. 11 Month contract with 60-day cancellation notice. Would you like more information on hours, classes and programs available at Gracie Barra Glendale? Please contact the school with your questions. Update the details, Write a Review or Report Error of Gracie Barra Glendale.